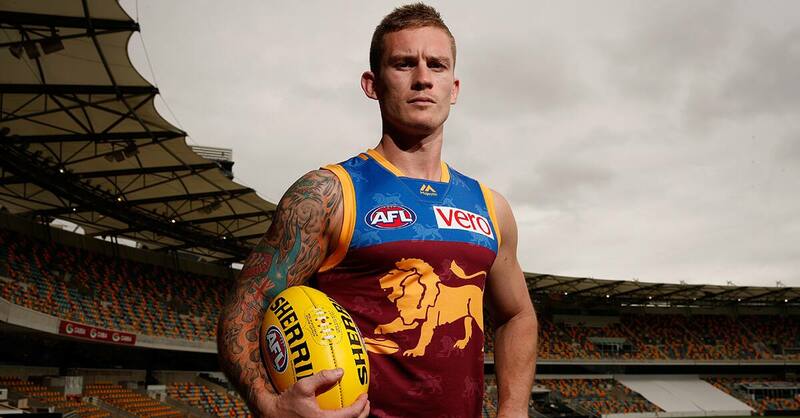 Dayne Beams will walk into the AFL All-Australian dinner in Melbourne next Wednesday hoping to walk out a member of football royalty. Beams is in with a real chance of becoming just the 19th player in AFL history to win All Australian selection with two different clubs. An All Australian choice when playing with Collingwood in 2012, the prolific midfielder is tipped by media pundits to be the Lions’ best chance of inclusion this year. It would be an extraordinary achievement for a player who has been through enormous personal turmoil this year following the death of his father in March. And it would put him in truly exclusive company. There are no less than 10 Brownlow Medallists in the 19 two-club All Australians, and together they would make a magnificent ‘team’ except for the lack of defenders. Beams, who is ranked 13th in the AFL Coach’s Association Player of the Year Award when voting went behind closed doors after Round 21, will be looking to become the 14th Brisbane player to win All-Australian selection. Despite missing one game for personal reasons, he leads the Lions in total possessions, contested possessions, uncontested possessions and clearances, and ranks 11th in the League for total possessions and 13th in clearances. And he’s kicked 16 goals. If Beams was to win All Australian selection he would replicate the 2017 effort of teammate Dayne Zorko, who is also tipped to be in the conversation again this year. Together the Lions’ 13 All Australians have won 29 AA ‘blazers’, headed by Michael Voss (5), Jason Akermanis (4) and Nigel Lappin (4). The group includes Brisbane Bears duo Mark Mickan and Matthew Campbell who won this enormous honour not through the current system which recognises home-and-away performance but after a national carnival when they played on a State of Origin basis for South Australia. Voss was All Australian captain in 2002 and 2003, and Brown was vice-captain in 2007. The issue of All Australian selection has been something of a moving feast in AFL ranks. The concept was pioneered by ‘Sporting Life’ magazine, who had a panel of experts select a squad from all footballing states each year from 1947-55. After the 1953 Australian Carnival in Adelaide, the first official All Australian team was selected purely on performances at the carnival. This continued after each series until the 1988 Bi-Centennial Championships in Adelaide. In 1982 the first AFL Team of the Year was chosen by the Victorian selectors before the advent of the national competition saw this concept changed to become known as the AFL All Australian team from 1991. Since 2007 the All-Australian selectors have announced a 40-man squad before the 22-man team is confirmed. Brisbane players included in the squad without winning selection in the team have been Jed Adcock and Nigel Lappin (2007), Simon Black and Daniel Bradshaw (2008) and Mitch Clark (2009). The Brisbane history comes on top of a proud and significant Fitzroy history in the same forum. Fitzroy players chosen in the Sporting Life Team of the Year were Noel Jarvis (1948) and Bill Stephen (1952). Other Fitzroy players chosen in the All Australian team after national carnivals were Garry Wilson (1979-80), Matt Rendell (1983-87), Bernie Quinlan (1883-84), Ross Thornton (1984), Paul Roos (1985-87-88) and Gary Pert (1985). Fitzroy players selected in the AFL Team of the Year were Quinlan (1983), Roos (1986-87) and Darren Kappler (1988). Roos was also picked in the AFL All Australian team in 1991-92 – both years as captain. Alastair Lynch, a key figure in the Brisbane Lions’ triple premiership success of 2001-02-03, won All Australian selection while playing with Fitzroy in 1993.